Metallics have been the darling of interior design for the past several years—silver, gold, and brass reign supreme in our homes, mixing together for every kind of look from eclectic to glam. But now, a new metallic has pushed its way into the inner circle: tin. The shiny material is among the top 100 trends for 2019, according to Pinterest, which found that this search term was up a whopping 563% year over year. Why has tin suddenly captured our hearts? It comes down to the metal’s texture—and any design-forward homeowner knows that texture is the No.1 mantra in decor these days. “Tin elements in interiors bring an element of pattern that is more subtle than colored tiles or wallpaper, introducing an element of harmony to a space,” explains Ingrid Fetell Lee, who shares design advice on her blog, The Aesthetics of Joy. “Tin touches can add personality to a variety of spaces in the home,” adds Washington, DC–based decorator and real estate agent Amber Harris of At Home DC. Here are eight stylish ways to work the tin trend into your decor this year. 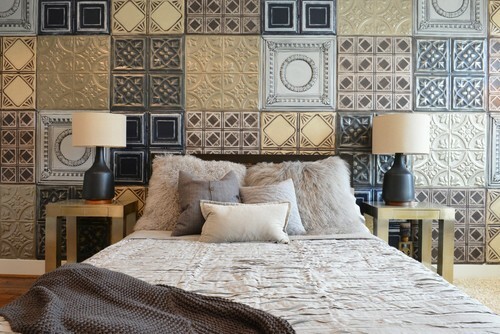 Spice things up in the bedroom with an eye-catching accent wall using large-format ceiling tiles in a variety of textures, patterns, and finishes, which can create a sleek, industrial look. Consider complementary metals and materials to make tin pop (metaphorically speaking, of course)—mix and mingle silver, pewter, copper, chrome, and even ceramic tiles. 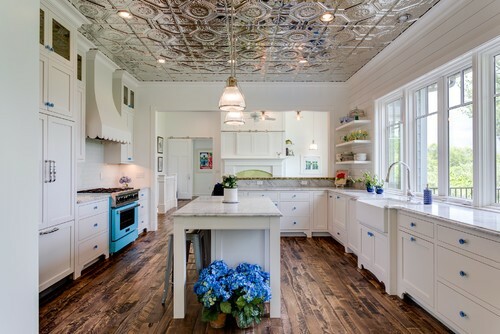 A pressed-tin ceiling can add a touch of elegance to a kitchen or dining room. Choose a shiny tin tile so light can reflect across the room and brighten up the space, and, hopefully, your mood. Photo by Groundswell Design Group Inc. 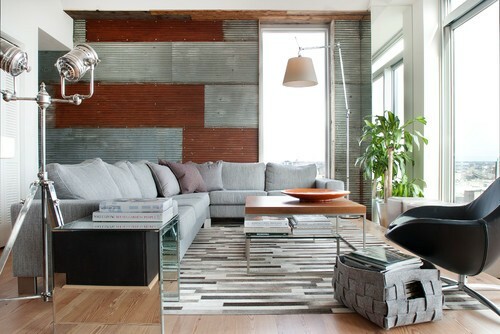 Achieve a decidedly urban look by creating a dramatic accent wall made of corrugated tin. Mix and match reclaimed and rusted corrugated metals to add texture and depth to the space—you can even add pops of color with rusty orange hues. Not ready to commit to installing metal sheets or tiles to your walls? Wallsauce.com makes nearly three dozen metal-effect wallpapers that can give a room an industrial aesthetic. It’s a good way to dip your toes into the tin trend. 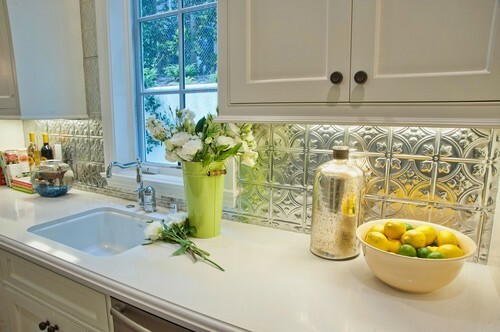 Transform drab wall spaces and add sparkle to your kitchen by incorporating a tin tile backsplash. Just like in other parts of the house, a kitchen backsplash made of tin can maximize light in the room and even give the impression of a bigger space. “A tin backsplash creates an immediate focal point in a kitchen, especially behind open shelving,” Fiori says. Add a corrugated tin wainscot to your home’s exterior to achieve a rustic contemporary look—all while protecting your wood walls from lawn sprinklers. Consider coating the metal panels with polyurethane to hold onto the level of rust that you prefer. 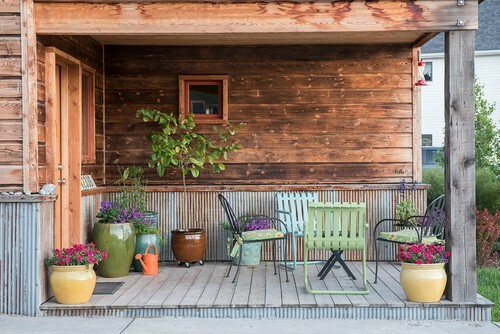 Complement the look with fresh accents like verdant shrubs and colorful blooms; the bold colors of nature will stand out against the industrial exterior and add visual flair to your curb appeal. More than a utilitarian metal, corrugated tin panels can modernize a fireplace and offer a refreshing departure from traditional brick and stone. And just like in the other spaces of your home, the smooth metal finish can brighten things up by reflecting light throughout the room. Plus, the sleek tin paneling can simultaneously blend in with existing decor and add character to a room in a way that more typical building materials are unable to do. It’s also a good choice in sunrooms, surrounded by natural materials such as wood, stone, and granite. 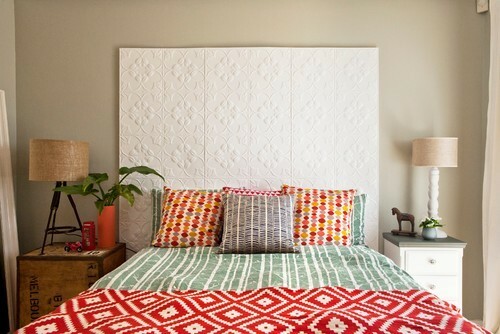 For all this talk of capitalizing on tin’s gleam and glitter, there’s another option: Pressed tin with raised designs—and painted in a matte white—can create a stylish headboard, adding a pop of drama to the room. This kind of design is artful and unexpected but still allows the room to remain restful. 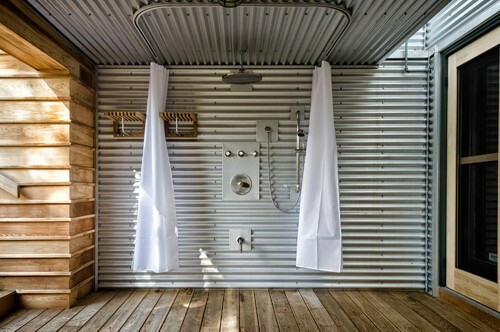 Photo by Ed Leimgardt Contracting Inc.
Give an outdoor space an industrial chic vibe with clean and classic corrugated tin panels. Durable and corrosion-resistant metal is a beautiful way to enhance an outdoor space that might otherwise be overlooked, like an exposed outdoor shower. 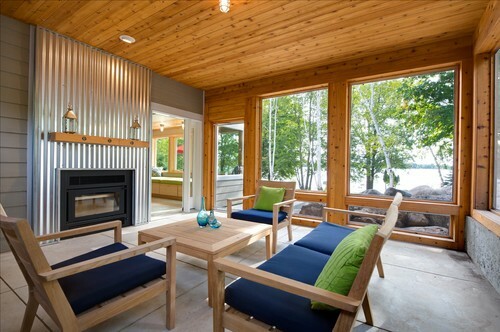 Or try stylish corrugated tin panels on a sun deck to complement weathered, wooden boards. They’ll add a surprisingly modern style and are an easy way to impress guests dropping by for a visit during the summer.